A FREE SITE TO LEARN HOW TO BECOME A BEACON OF LIGHT! and Becoming a Beacon of Light in the World! "Yielding flexibility is a virtue of the ever-expanding heart." I would love to begin this course module by talking about...love. When we allow our heart to guide us, we realize that love, honor, and truth are at the core of absolutely everything an Earthly Angel represents. Love propels us and illuminates the way for others and ourselves. Honor ensures that all souls are treated respectfully. Truth ensures that all souls are treated equally. I believe each one of us must begin our walk of truth, self-love, and heart-centered conscious living in order to move deeper into the heart. Only from that place can we experience Heaven on earth and become Earthly Angels. To have any one of these things, it is crucial to remain conscious. It is not possible for us to achieve self-love, truthful living, and heart-centered consciousness if we are not living mindfully. We must take intentional steps, moment by moment, to remain centered in our heart and not fall into the traps of the mind. Staying conscious means we realize when we have zoomed away from our heart by focusing on negativity in any of its insidious forms. It means we take note the moment a negative thought loop has begun playing over and over in our mind, or when a negative belief has been presented before us by another soul, telling us an untruth about the value of another soul, creature, or our own self-worth. Conscious living means we take immediate, positive action to end any negative thought or behavior directed towards another or ourselves that is not heart-centered or unloving and replace it with love, positivity, strength, and solutions. Staying conscious also means we recognize when we ourselves have told an untruth, and then face it with truth. In this way, we rectify the untruthful event we may have created in order to return honor to each of our relationships. Create a new vision. Instead of viewing something as a problem or tragedy, view each experience placed before you as a positive challenge or an opportunity to overcome something by choosing from among limitless options and solutions at your disposal. Find the gift(s) that lie beneath the surface of a challenging experience. Gifts are experiences placed before you by the Universe to make you stronger, brighter, wiser, more compassionate, and illuminated. These experiences contain clues, pieces of the puzzle that provides answers to your life purpose. Switch your attitude to the positive by finding the Divine Reason behind the current life experience you are traveling through. Divine Reason allows you to view the bigger, universal picture for yourself and for humanity. Remain connected with your inner light, always. Maintaining your connection to the light prevents the downward spiral into negativity. When we allow ourselves to spiral downward, we begin to close off our connection to our heart and our inner light. To break this pattern, a soul must make the conscious choice to open the heart, reconnect with the inner light, and then spiral back up into positivity. The easiest solution is to prevent the downward spiral in the first place by focusing on the positive! Snap your fingers the moment you feel yourself beginning to focus on negativity. This simple act allows you to make the conscious choice to snap your awareness back to the present and remain in a joyful state of being. Infuse your being with love and light throughout the day by placing the intention to allow universal light to flow in freely through the top of your head. Walk. Get out in nature -- barefoot if you can -- and place the intention to allow the grounding earth-energy to flow into you up through the bottoms of your feet. Drive. Get in your car alone (or hop on your bike or motorcycle), and drive in silence anywhere your heart leads you for at least 30 to 45 minutes. Drive, pedal, or ride until you feel re-connected with your heart. Look up at the stars in the evening sky and feel on the deepest level possible the infinite and loving support of the Universe right above you. Talk to the Angels. Ask them for guidance and assistance. Request that the Angels bombard you with signs and messages of pure inspiration. Consciously switch your focus to something that is positive, and then jump to another positive thought, and another, and another until you begin to feel positively better! Say this positive mantra out loud until you feel a positive shift in your heart: "I'm getting brighter and brighter and brighter and brighter! What Would Honor and Love Do? Taking positive, intentional steps shapes the essence of who we are and how we are perceived by other souls and God's creatures. These acts also form our core integrity and move our focus into the heart so that we can see, hear, and feel the world from the heart's perspective. During any experience placed before us, we can stay in alignment with positivity, truth, and goodness by asking ourselves a question: What would honor and love do here? What negative thought(s) was I focusing on? When did I get off track? How did I get off track? By asking questions of our heart, we can always find our way back to this truth. There is no love in negativity. Negativity is a form of fear. When fear is present, it is vital to peel back each layer of information to find out what triggered that fear instead of plowing past it and allowing the experience that generated the fear to go unresolved, traveling unchecked through the hallways of our mind. Whenever we make the choice to bring fear into the light with truth-seeking questions, we shall find soul-growing answers. On a soul level, we are the essence of love. Negativity and fear are not a truth for us, or for humanity. Ending the pattern of negative thinking allows each one of us to step into our divinity and our essence…LOVE. What Transmission or Signal Are You Emitting? We send transmissions out to the Universe all the time. We can send out a positive transmission that says, "I am grateful for my life." We can send out a negative transmission that says, "Nothing ever good happens to me." When we truly love others, and ourselves, live in the truth, and practice heart-centered consciousness we raise our vibration and this brings us closer and closer to aligning with our true essence -- love. "I love myself. I love you too! You can trust me for I will be the same person of integrity in or out of your presence. I know in my heart all souls and creatures hold immense value in the eyes of the Universe. I live by this truth daily and I honor each living thing that crosses my path." Other souls and creatures we encounter that live on this same vibration of LOVE can pick up our frequency or transmission of the heart that we are emitting. The reason this is possible is because we have moved into alignment and harmony with one another. It's as if we each one of us has tuned into the same positive radio station frequency at 111.1 FM! This is why the old adage, "birds of a feather flock together" is used because "like-minded" and "like-hearted" souls find each other and stick together. Conversely, if we are filling our mind with negative thoughts, acting negatively, surrounding ourselves with negative people, and finding ourselves experiencing one negative encounter after another, we most likely are tuned into the vibration of negativity at radio station frequency 666.6 FM and sending out a negative transmission which allows souls that are focusing on the negative to find us. These negative encounters may look like bar fights, family quarrels, someone cuts us off in traffic, or our car is stolen. We may experience illnesses like a heart attack, depression, or anxiety. We may experience long painful journeys with rage, jealousy, frustration, and fear. When we make the choice to send out a positive transmission we soon discover we want to surround ourselves with positive people and those souls that choose to remain negative begin to drop away or our encounters with them become less frequent. The reason for this is they no longer match our frequency. We have changed our radio station from 666.6 FM back to 111.1 FM. This positive frequency change allows for lovely new souls to find us and begin filling in the gap left behind from the departure of the negative souls. We constantly change our frequency based on those things we focus on and allow into our existence. So, focus on the positive. Choose love. Show compassion to others and yourself while you are learning, and you will begin experiencing positive and amazing shifting in your life! I've found one of the easiest ways we can find our way to the truth regarding how frequency and transmission works is by pulling forward a time fragment memory regarding a negative encounter with someone we didn't know. Once we have pulled a memory forward we can be still and start asking our heart lots and lots of questions: Where were my thoughts that day before the negative encounter? What was the transmission I was sending out? Why did that encounter occur? Did I yell at someone, tell an untruth to someone, or have negative looping thoughts playing over and over in my mind before that encounter? What was I supposed to have learned from the experience that I might have missed? If we connect the dots regarding any negative encounter we will most likely find at that time we were sending out a negative transmission or at the point of contact with something negative we agreed to align with it instead of becoming a conscious observer transmitting our signal of positivity by remaining centered in our heart and flowing out love during the negative experience. If we look at negative situations we were involved in, in a positive light we will also "see" that we can use that experience to further our learning for a soul growth opportunity in some way, shape, or form. Please listen to this audio clip from my radio interview on The Knights of Liberty radio show with Andy Peaher and Tim Spearman in Grimsby, England that explains more in-depth why our frequency is a vital component for creating positive experiences. Special note on minutes and not being hard on yourself: This is a minute by minute walk. Some days we can be in the flow and some days it seems as if nothing is going right. This is why we can experience synchronicity after synchronicity, Angel sign after Angel sign, and then, just like that everything comes to a screeching halt. We have actually created a new illusion, the result of switching our thoughts from the positive to the negative because the truth is, the Universe is still flowing us one cool thing after another. The reason we stopped experiencing cool stuff is somewhere along the line at the point of our last magical encounter we began closing off the flow of love to our heart. Another thing to remember is anything negative is not positive. So anything negative that we allow into our existence to "stick" around and "hang out" with us without switching back to the positive as quickly as possible can knock us off our center and close off the flow of love to our heart. When we focus on the negative or stop the flow of love we make the choice to pick up our "blinders" and place them back over our eyes and shield our heart in order to prevent the "light" from getting in. It's similar to what we do when we head outdoors into the sun. We make the choice to put on our sunglasses to shield our eyes from the brilliant rays of "light." As soon as you notice the flow of positivity has ceased showing up in your life and negative thoughts or experiences have arrived, visualize filling your heart to capacity with love and then sending love around the world. This is an important daily practice even when things are going well. And if you are about to perform any kind of energy healing on another person or yourself, first fill your heart to capacity with love and then begin the healing session. If you want to manifest your heart’s desire, fill your heart to capacity with love and then hold that dream bathed in love before sending the request out to the Universe. Here are three simple ways to fill your heart with love through visualization. Imagine that your heart is a popcorn-making machine, but instead of popcorn, visualize the machine filling up with tiny red hearts. Notice the feeling of love that grows inside your being. As the machine (your Sacred Heart) fills to capacity with love (the tiny red hearts), see it continue to expand and expand until it seems as if the love you are creating may burst right out the top! Imagine your heart as an old-fashioned carnival bell atop a very high pole. Begin filling your heart with love. When your heart has filled to capacity, imagine picking up a huge mallet and then hitting the depressor at your feet as you watch the metal object go all the way up the pole and ring the bell (your Sacred Heart) with a resounding "Ding!" Imagine that you just entered a white elevator. Turn to face the elevator panel and press the button that says "Heart Center.” When the door to the elevator opens on the “heart” floor, imagine opening your arms wide, tilting your head back and, as you begin to hear the beating of your heart, feel the infinite LOVE from the Universe flowing in and filling your heart to capacity! Once your heart is filled to capacity, share it with the world! The more love you give, the more love you’ll receive -- so send love, light, and blessings across the earth to everyone and everything! When Earthly Angels send light, everyone is included in their wave of love -- even those who may have created the most heartache and pain. Sending negative souls love and blessings will help them to awaken sooner and, when they do, they will begin to contribute positively to humanity instead of causing hardship. Everyone wins! 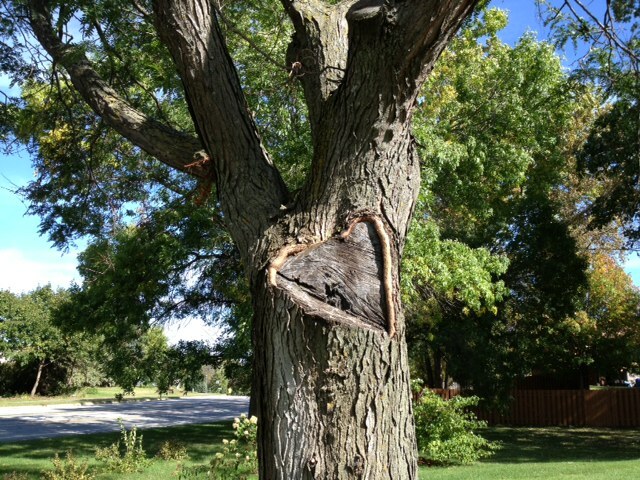 Love is all around us. But we alone must make the choice to remain anchored in our heart. The simple, intentional act of remaining anchored in the heart allows us to focus on love, truth, and all things positive. When we make the choice to see with the eyes of the heart, we also begin to "see," "hear," and “feel” multi-dimensional messages (layers of additional information that are revealed to any soul in search of pure wisdom). These messages may come in the form of Divine Clues in words of love spoken by another; in the feelings of loving energy sent from another’s heart; or in the appearance of an inspiring heart-shaped object or image. Or all of the above! Become centered in your heart-space by focusing on the bright light within your heart-center. Place the intention that you want to ground your life in love and truth. Ask the Angels to help you find heart-shaped objects and images. Pay close attention when you feel inspired to cast your gaze in a certain direction. This impulse may be the Angels speaking to you and directing your focus toward a heart-shaped item! When you see your sign, document it with a photo and then share it with the world! 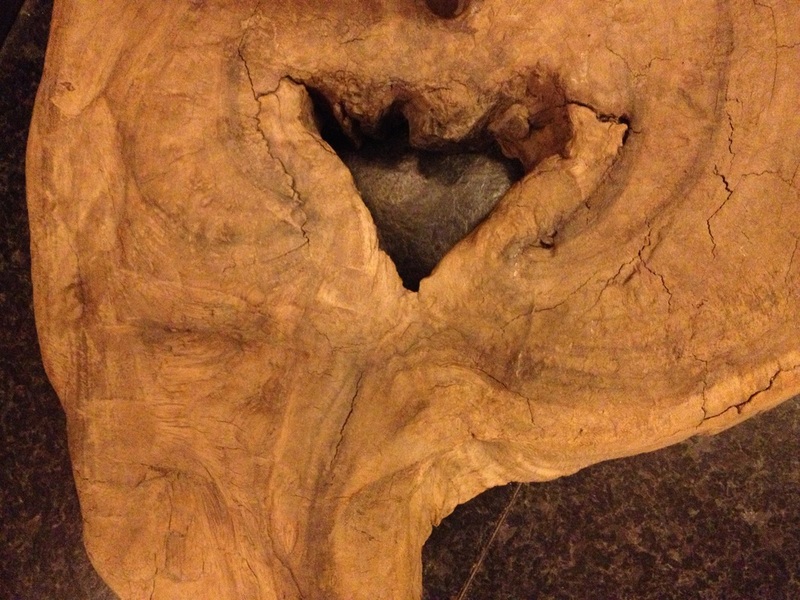 I've found heart shapes in tree trunks, rocks, and even potholes! The heart shapes the Angels will flow to you are endless, clever, and truly inspirational! One of the fun ways to gently remind yourself of your heart-centered mission is by wearing a simple symbol. Try wearing a heart-shaped necklace, pin, earrings, words of love on your clothing, or even getting a heart tattoo! You can also place a heart-shaped stone in your pocket. What a simple way to carry love on the go! When you incorporate these steps into your daily routine, love will begin to flow into your life in thousands of ways. When we focus on love, we shall experience love. In every moment of our sacred journey we can make the choice to love. We can breathe love into each experience. We can send love out like a beacon from our heart-center in a wave of light. We can deliver messages of light from our lips to the heart of another. We can infuse love into our work or favorite hobby. And we can move about the earth leaving light trails in our footsteps. 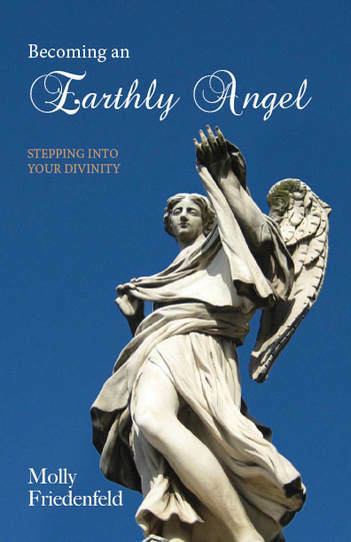 As Earthly Angels, we can create a simple, heart-centered intention that with every step we take, we shall also send the light of our heart out through the bottoms of our feet and then ground it deep into the earth. This loving energy is purposefully left behind so that all souls that cross this path may encounter the light of our heart and then draw from that energy to brighten their experience here. When we realize every moment is sacred, we understand that every footstep is sacred too. Once you choose to become an Earthly Angel, one of the main themes you will begin to notice is finding yourself positioned in front of souls who need to be infused with love and light. Such a soul may be feeling unworthy and just needs to know how precious and beautiful he or she truly is. Souls may also be placed before you that are feeling bullied, unsafe, or fearful. For example, in April 2014, my husband Peter and I were in New Orleans, Louisiana. It was 9 p.m. and I was walking back to our hotel alone, as Peter was at a business dinner. Just then, I noticed an elderly couple walking ahead of me. As I approached, I could feel the energy of fear and anxiety emanating from them. So I did what any Earthly Angel would do. I stopped and asked if I could help them in any way. And then, as I pointed in the direction of the Hilton, I quickly pulled out my iPhone so I could show them on a map that they were just four blocks away and closing in on their final destination. When the man assured me he now knew where to go and I could feel their energy stabilize, I said goodnight and went on my way. Minutes later, I passed under a set of bleachers that were set up in preparation for the Mardi Gras festivities the following week. Suddenly, a droplet of water fell from over my head onto the ground. My gaze was directed downward, and there on the brick sidewalk I noticed the droplet had landed in the shape of a heart! This is just one of the brilliant ways Angels say thank you for helping another soul in need. Earthly Angels will often find themselves faced with such opportunities to assist others. Here is another example. In May 2013, my husband and I were traveling through Kansas City, Kansas. Whenever we visit a new city, we like to take a walk and get the vibe of the place. He and I had been walking for only a short time when we turned the corner by a high-rise office building and came upon an accident scene. A woman bicyclist was on the ground, an ambulance had arrived, and the EMTs were preparing to place her on a stretcher. I immediately placed my hand on my chest to lock myself into my heart-space. As we passed by, I raised my other hand and sent light from my hand to her heart. I continued to send her love with a message embedded in the light. I told her, "We are connected. You are safe. You are in good hands and it will be all right." My husband and I continued walking for another block or two, and as we turned the corner I felt compelled to cast my gaze downward. There I found a perfect, heart-shaped rock right in the middle of the sidewalk. I picked it up and immediately said, "Thank you, thank you, thank you!" I wanted to make sure I showed gratitude to the Angels for flowing before me the opportunity to send another soul love and compassion when that person needed it most. In addition, I wanted to give thanks for the lovely heart-shaped rock they placed in my path! Send love not fear: When you encounter any kind of accident scene, please send healing, love, compassion, and light instead of sorrow or fear. Love conquers all and heals all energetically. If you encounter any situation or view a story on television where a soul has perished send love from your heart to that soul and wish them a peaceful journey guided by their Angels back to the light. Another simple way to flow love into your life is by flowing love out to the world. It creates a wonderful cycle. You flow love out to the world. Love flows back to you and lands in your heart and then the cycle repeats. One way I model this out in the world is with my personalized license plate. Each time I get on the road I allow hundreds of other souls driving by me in their cars or walking by my car in the parking lot to see the powerful message on my license plate. Who knows my license plate might end up being the one message that helps another soul see their Angel sign that day. Or perhaps it allows a soul experiencing sadness to remember that they are surrounded by love and that Angels do exist! It might also be the trigger that piques the interest of a passenger in another car to ask, "What does 444 mean?" And that's all it takes to start a wave of love in motion. Can you see all the messages I am sending with my one little plate? There are actually 4 messages. When we surrender to the heart and continue to access the wisdom of the heart we can remain flexible and open to change while we travel on our journeys. This allows us to expand the heart and grow, even if those around us refuse to do the same. Love and compassion allow those of us with expanding hearts to see the goodness in all souls, even those who may currently be rigid, stubborn, and unwavering in their ways. Love and compassion are the magic ingredients that allow Earthly Angels the opportunity to shine light into the heart of another that has been closed down by fear or pain. A soul with an expanding heart understands we cannot force another to see the things we 'see' or hear the things we 'hear,' or even be as excited as we are about the things we are learning and discovering. A soul with an expanding heart understands the heart of every soul unlocks when it is Divine Time. This helps us to feel this TRUTH - no one has the ability to 'command' another to awaken or ingest the knowledge we may have to dispense. Every soul is on their individual journey and learning at their own pace. For this reason we are also asked to show patience, love, and compassion to those souls we may encounter that might not believe in the same things we do or understand the things we are experiencing. We can remain in a state of peace during these times while waiting for family members, friends, and others around the world to awaken by holding all souls in a positive vision of love and having absolute faith that they too will awaken some day soon and reconnect with their inner light. We can also hold peace in our hearts by understanding what may be viewed as repeated "bad decision choices or failures" on our soul's journey or that of another may actually be one of the ways we can lead the soul out of darkness to experience victory in the light. We can also remain peaceful by holding the feeling in our heart how wonderful it will be when we are able to be present with open arms to embrace each soul with love the moment each heart unlocks and each mind awakens. Every act of kindness makes a difference and creates a time fragment that allows a soul a reference point to return to in the heart to help them "remember" that someone truly cares. Earthly Angels beam light across the earth in infinite ways. One of those ways is by spreading joy. Did you know your joy could be the impetus that motivates others to find their own way to joy? Here's one example. A few years back, my granddaughter Hailey and I were at a local shopping mall. We had stopped for a moment in front of a store with three mannequins in its window when an idea popped in. I said, "Hailey, let's pretend we are mannequins too!" Hailey got a sparkle in her eye. "Can I go first, Grandma?" she asked. Moments later, Hailey was stationed by the mannequins next to the window striking her first pose. As I snapped a few pictures of this playful little Earthly Angel, I soon noticed that I was not the only one with a smile on my face. Other shoppers were having just as much fun watching Hailey, the child mannequin, next to the store window. Hailey's joy was contagious, and she was spreading light throughout the shopping mall without even moving a muscle. There are many creative ways to spread joy. My friends Kathy and her husband Mike are pirates. Not the scary kind that steal your maidens and money. These pirates steal your heart. Mike and Kathy are Earthly Angels from Minneapolis. Kathy and I met when we were six-year-old first graders at Lakeview Elementary School in Robbinsdale, Minnesota. Mike and Kathy attend local fundraising events dressed up as Twin Cities Captain Jack and his fair maiden Arabella. At each fundraiser, Captain Jack joyfully poses for photos with guests in exchange for a donation. The donations go to benefit the charity. ﻿Decide to be of help. Start the day by placing a simple intention of goodness and asking the Angels to put someone in front of you that you can assist unconditionally in some big or small way. Then watch what happens! Demonstrate it. Show others the way of love by being a positive role model and demonstrating your Earthly Angel skills. Teach it forward. If you have gathered great wisdom through a difficult lesson, tell others about it. By telling your story honestly, with humility, and from your heart, you can give others insight regarding a problem they may be experiencing and become the instrument for another soul’s learning and growth. Show gratitude. Whenever you receive a blessing, the Universe always presents a follow-up opportunity to bless someone in return. Grasp every opportunity for gratitude as it comes along by graciously blessing another soul or one of God’s creatures. I feel blessed every time my Angels place me in the path of another Earthly Angel. I have found that each encounter contains an opportunity for both of us to bless the other in some way. Earthly Angels have difficult days, too, and perhaps we will inspire one another with the extension of our loving energy and kind words. And if we take the time to listen, we may also find that an Earthly Angel has a story to share that contains exactly the information we need to hear. For example, on one occasion while at a department store, I asked my Angels to guide me to the checkout lane with the cashier who would tell me something I needed to hear that day. Shortly thereafter, I allowed my heart to guide me to the lane being staffed by a young woman cashier about four lanes from where I had been standing. As I approached, I could tell just by watching her interact with the customers ahead of me that this young woman lived from her heart. When it became my turn, she greeted me with a smile, just as she had all her previous customers. Her name was Nathalee. 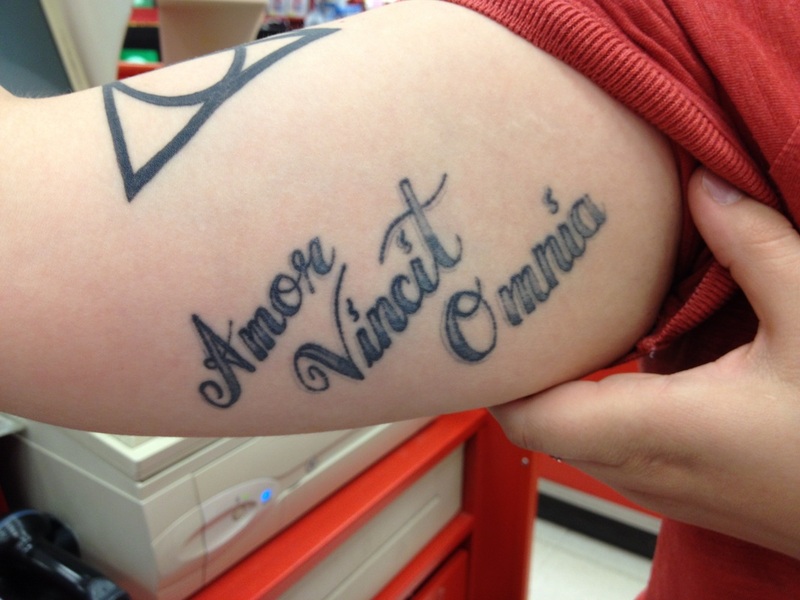 I told her honestly that I loved the tattoo on the inside of her arm. It stated, My light in the darkness. I asked Nathalee if she would share its significance. She told me she got the tattoo in honor of her mother, who is still living. "My mother has always been a pillar of strength and support for me," Nathalee said. "I've been through some difficult times, and my mom is my light in the darkness." I was amazed at the synchronistic gift of confirmation I received upon listening to Nathalee’s story. At this same point in time I had been writing about the sacred role of a Guardian of Light -- a soul who is responsible for keeping the light shining bright through times of darkness. How cool is that?! In one encounter I discovered an Earthly Angel named Nathalee and heard a story about her mother, a Guardian of Light! (Scroll down to find Guardian of Light information). Special note: When you are at the shopping mall, grocery store, or movie theatre, ask your Angels which aisle or lane your heart is calling you to choose. You will be amazed at the wonderful souls you will meet and the blessings you will encounter. 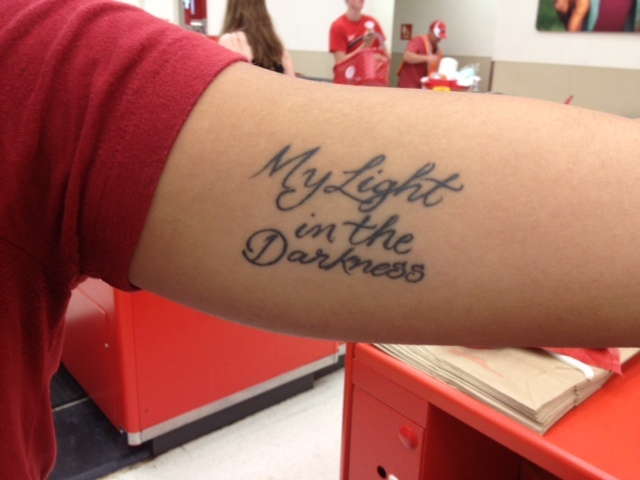 Another Earthly Angel Target employee had this powerful message tattooed on her arm. On another occasion, half way across country, I met Serafin, the Earthly Angel security guard, at the Tampa, Florida airport. I remember telling him how much I loved his Angel name. I also loved his grounded energy. He was a sentry of peace amidst the hustle and bustle of the airport security checkpoint. I felt a little awkward, but I couldn't help myself. I asked, "Would it be possible to take a picture of your name tag?" He replied, "Don't you want a picture of me, too?" I laughed and said, "Of course!" I then snapped a couple of fabulous pictures to document my Earthly Angel encounter at the airport. When you are at the shopping mall, grocery store, movie theater, or even a home-improvement store, ask the Angels which aisle or lane your heart is calling you to choose. You will be amazed at the wonderful souls you will meet and the blessings you will encounter by asking for assistance with simple requests. Earthly Angels may have Angel names. Be on the lookout for them; it will help you to identify these souls. Seraphin, Seraphina, Serafim, Angel, Angelo, Angela, Angelina, Raphael, Gabriel, Gabriella, Ariel, Daniel, Michael etc. Earthly Angels wear identifying symbols. These symbols may include emblems such as Angel wings, harps, halos, clouds, or feathers on clothing, jewelry, or even tattoos. Earthly Angels are professional “yielders.” They yield to other souls in traffic, allow other souls to go ahead in line, open doors for everyone, and listen patiently without interrupting during conversations. They model goodness and unconditional love. They dispense wisdom with grace and humility, never force. They find joy in assisting other souls in remembering their divinity and the immense value each soul and creature holds in the eyes of the Universe. They extend themselves on a moment’s notice to create mini-miracles and bless other souls. and then start sharing those gifts as quickly as possible with as many souls as possible. Did you know the significance of the "el" ending at the end of the primary Angel names? The word El means God. Some of the common names of the primary Angels are Ariel, Gabriel, Daniel, Michael, Uriel, Raphael, Chamuel, Cassiel, and Ezekiel. So each Angel has their unique essence contained within the root of their name like "Ari," "Micha," and "Gabri." El is then added to complete the Angel's name to anchor the essence of God within each name. Like an Earthly Angel, a Guardian of Light is a soul responsible for keeping the light shining across the planet by spreading love, honor, and truth. A Guardian of Light is also a protector of the light itself. Whenever a Guardian of Light sees the light of another being dimmed by dishonorable behavior, he or she bravely steps forward to illuminate the way with love and truth on behalf of that soul. A Guardian of Light is a peaceful soul and does not subscribe to the old-world ways of battles, struggles, or fights. He or she stands ready to break patterns of dishonorable behavior, cruelty, injustice, and all things that have not served humanity positively since the beginning of time. we shall always remove pain. Did you know it takes months, years, even decades to earn someone's trust and only one experience of betrayal to lose that trust? We can become the souls we want other souls to be for us. We can help souls trust and live from the heart by showing them how we live from ours. Each time we make these simple, positive choices in the moment, the world becomes brighter and brighter! Moving about the planet centered in the heart and doing things the angelic way is called the way of light. As you can see, there is tremendous power in shining our heart-light out into the world. It always makes a difference. Why? Because each of us is a human being of light, and the energetic essences of Peace, Joy, Love, and Truth are contained within the light, or spark of divinity, that resides in our Sacred Heart. Peace, Joy, Love, and Truth are known as the Four Pillars of Humanity. This is because they are our soul’s foundation. Once we become anchored in the heart and live from this sacred space, the spark of our divinity contained within our Sacred Heart in the physical body begins to create a stronger connection, or column of light, to our spark of divinity that resides in Heaven. When this occurs, we begin to look beyond the self and walk on earth as it is in Heaven, weaving the positive energies embodied in the Four Pillars of Humanity across the earth in equal measure in our own magical way. We become an Earthly Angel, bringing Heaven to earth and spreading Peace, Joy, Love, and Truth in harmony and balance. An Earthly Angel of Peace is the soul other souls return to time and again for comfort and serenity because they know innately that this soul carries the light of tranquility within. This Earthly Angel is a Weaver of Peace. An Earthly Angel of Joy is the soul who can encounter a negative situation and with his or her light change the experience to one that leaves a positive impact on the hearts of all. This Earthly Angel is a Beacon of Joy. An Earthly Angel of Love is the soul who demonstrates to others how to return to the essence of love while his or her feet walk upon this earth by connecting to the inner light and accessing the wisdom of the heart. This Earthly Angel is a Light of Love. An Earthly Angel of Truth is the soul who assists others with patience to see the light. He or she guides them in following the pathway of truth. This pathway is the route each soul must choose in order to step into his or her divinity and discover the gifts that the soul has agreed to share with the world. This Earthly Angel is a Bearer of Truth. I created a video for all of you that I thought would best explain the simple yet infinite ways we can send light around the world in seconds. This video takes you in depth on the essence of what it is like to become a Guardian of Light. Sending love and light to others, anywhere and at any time, is very easy. You can send love and light while you are walking, waiting for a plane, or even standing in line at the grocery story. It doesn't matter if you do it aloud or in your head. The effect is the same. Think of all the people in your life that you love. Begin by stating the name of one person at a time. (For example: John Doe.) "John Doe, I love you. I love you. I love you." Go on to the next person. "Jane Smith, I love you. I love you. I love you." Repeat the steps until you mention all the people you love. Once you've gone through the list of all the people you love on this physical plane, you may continue by sending love to all the souls that have transitioned to the light. Next, send love by naming the people with whom you are currently having a difficult time or you need to forgive in some way. You can also send love to a soul who has died suddenly, committed suicide, or even send a wave of love to an entire country! The options of sending love are endless. The love you will receive in return is divine. End by stating from your heart, "Let peace and love reign in my world." we could attain inner peace with the knowledge that many people on this planet would be hurting a whole lot less. Divine energy allows Angels to work behind the scenes to flow souls in front of other souls at the perfect time. Whether we realize it or not, many times each day we are lovingly guided to bless another soul with our presence, receive wisdom, create a mini miracle or deliver inspirational messages on behalf of the Angels and those who have transitioned to the light (as I did on behalf of the woman’s husband in the previous story). I call this gift people whispering. Many times I have been guided by my Angels to drive through a random neighborhood, go down a specific aisle at the grocery store, or even stand next to a specific person in line at the airport. When this first started happening, I didn't understand it and I would actually get frustrated with myself for taking a wrong turn or saying something to a stranger that made no sense to me. But as I know now, there are no coincidences -- and that means there are no wrong turns, either. What can seem to be a random impulse or silly mistake may actually serve some kind of Divine Purpose. I'll also scan the area by sending out a 360-degree beacon of light from my heart until I feel it has landed on the person I am being asked to connect with. As I am doing this, I will have a thought or sentence repeat in my head, or something will pop in that is so random I know it's not for me, but for the person I am connecting with. The next two stories will explain what this experience looks, feels, and sounds like. I recently traveled through the San Francisco airport. My husband and I were standing in line at the security checkpoint. I felt there was someone in the crowd I was supposed to give a message to but I wasn't sure who it was yet. I then asked a male TSA security guard if I could receive a pat down instead of going through the Xray scanning machine. He immediately guided me to a security guard named Aisha. "BINGO!" I said in my head. "She's the one." As Aisha was giving me the pat down my heart started filling up with love. I then started hearing in my head, "Please tell her she is beautiful. Please tell her she is beautiful." Aisha, had skin grafting scars that covered her arms and her face. I could see and feel her true beauty inside and out. I could also feel her energy was down quite a bit and that she needed a jolt of love and truth so that she would always remember how beautiful she truly is. Once she was finished with my security check pat down I gave her the message from her Angels. I said, "I have to tell you something quickly. I connect people with their Angels, and your Angels wanted me to tell you how absolutely beautiful you are." As I finished giving her the message she put her hand to her heart. Aisha said, "Oh my gosh. Thank you, thank you so much! I can't believe this." I gave her a hug and when I bent down to grab my suitcase, there on the floor was one single dime. Please remember this lovely truth. When we bless others, we shall always receive a blessing in return. For love is expansive and what goes around...comes around. 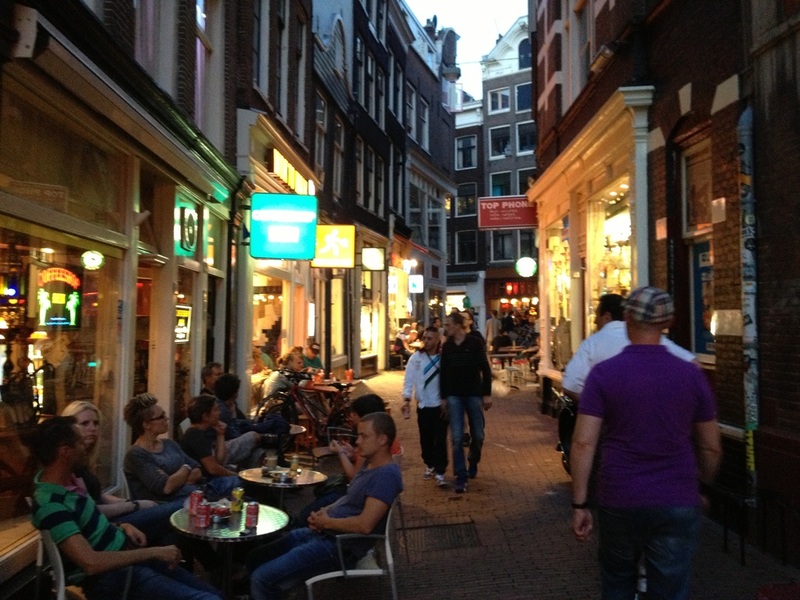 In August 2013 my husband Peter and I traveled through Amsterdam, Holland on our way to Spain. One evening we chose a quiet sidewalk café for dinner. Our waiter was a young man named Ben. He was a gentle soul, but I could feel such sadness in his energy. As he placed our food on the table I saw that he had a large tattoo of a heart on his arm. The moment my eyes landed on his tattoo, I started receiving a repeated message from the energy of a young man who had transitioned to the light. In my mind I kept hearing, "My heart bleeds. My heart bleeds." When Ben returned to our table to ask how our meal was, I asked if it would be all right for me to deliver a message to him from his friend. Ben looked worried but nodded his head. I began by stating, "I know your friend's transition to the light has been extremely difficult for you, but he really wants you to move forward." I continued, "Your friend said that by moving past the painful memories surrounding the event that caused his transition, you will be able to honor his journey -- and yours, too. He says he doesn't want you to relive the pain of that day any longer because he knows it has been holding you back." Ben then told me his story. His friend had indeed transitioned earlier that year in a foreign prison, and Ben was feeling guilty that he hadn't been able to help him. In addition, Ben said that he’d been reliving the experience of that painful event over and over in his mind like an endless movie looping on a never-ending reel. He felt as if his heart was bleeding. I finished the message by stating, "Your friend wants you to start living by loving life, and to remember and focus on the wonderful memories you two shared together -- not the negative memories that are currently running through your mind." As I looked into Ben’s eyes, I felt on an energetic level the release of a piece of the pain Ben’s heart had been holding onto. I then sent him a wave of love with a message embedded in the light: “You are powerful and bright, all is healed in the light.” The message traveled from my heart to Ben’s heart to fill the gap where the negative energy once resided. The sadness on his face softened. “Some light got in,” I thought to myself. He thanked me sincerely and disappeared into the restaurant to retrieve a meal for another table. The Angels and our loved ones who have transitioned to the light want us to remain in our joy rather than in sorrow. This causes us to maintain a higher vibration, which then allows us to connect effectively with those on the other side. Do not focus on the illusion of a soul’s “death;” celebrate his or her life and transition to Heaven instead. Have you begun to recognize the meaning or theme of each soul growth lesson that has been placed before you by your Angels and Guides of Light with more frequency and ease? 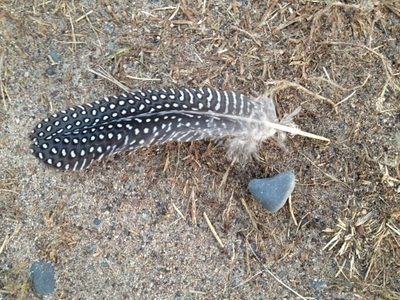 Please jot down a recent soul growth lesson experience that pops into your head and its theme. Feel free to write any information that flows in after as you are writing in your journal. What have been two of the most difficult "sticking points" on your spiritual journey thus far? Sticking points are difficult lessons that your spirit is resisting. Resistance causes the lessons or events to get "stuck" in a holding pattern and continually repeat until you are ready to find your way to the truth and absorb the lesson for soul growth expansion. Do you feel at this time like you are changing and expanding on a soul level more and more each day?